I have wanted a worm box for some time. Since moving to the new house, I have made a few changes. One change was to stop having yard debris pick-up. What would have gone in the yard debris container, is now going to be compost and if need be, worm food. Yep, worm food. On those days that the kitchen does not yield enough food for the worms, I will grab a bit off the top of the compost pile. Grass clippings, leaves, and bits of sod, are all nice meals for worms. 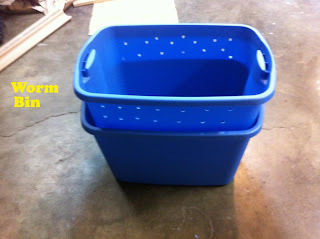 Purchase two large, lidded containers. You will want solid color containers, remember worms usually live underground and prefer the darkness. Drill some well placed holes. Larger holes around the sides, and smaller ones in the bottom. This container has no holes. This is a "catch" container for any fluids that might drain away from the worm box. 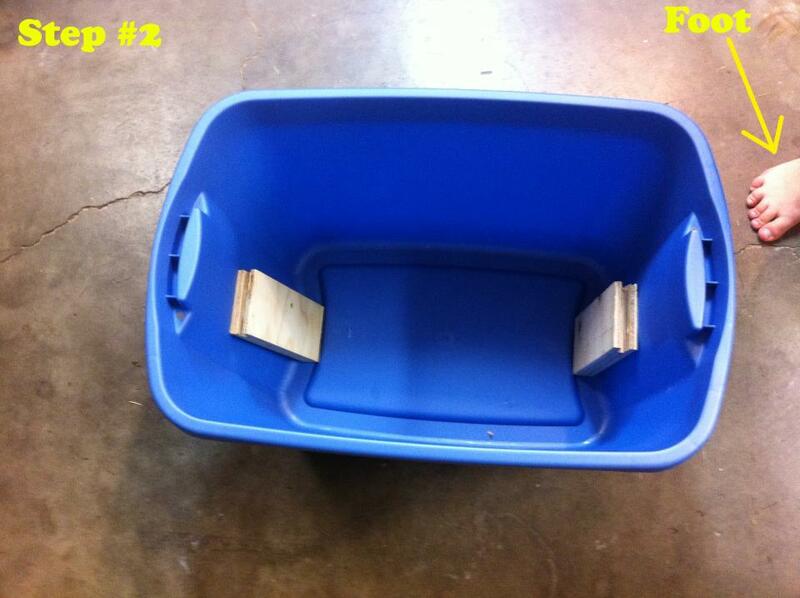 You will need two pieces of wood or bricks to support the worm box. Stack the containers, add food scraps and worms. And a little bit of water, again remember worms are usually underground where it is moist. Keep both covered with a layer of shredded newspaper, which the worms will also consume with gusto! I plan on adding a layer of shredded newspaper and then a layer of my homemade brown bag mulch. After a few days or weeks, you can start harvesting the castings. When you are ready to harvest, place the food to one side of the box, and the worms will naturally stay on that side, to feed. The side without food will be easy to harvest from. You can harvest the tea as soon as it begins to collect in the catch container. To make a gallon of worm tea, add 1 T of the dark fluid to a gallon of water. Your house plants will love you for it! 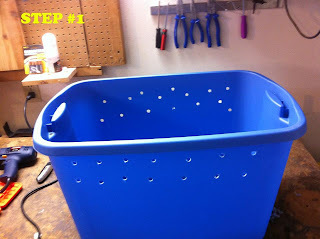 A worm box is a living part of gardening and homemaking. This box will sit in my garage, where it won't get too hot or too cold, depending upon the season. Also an easy and convenient place to quickly take kitchen scraps. I know if I keep these tasks easy, it will be easy to work them into my day. 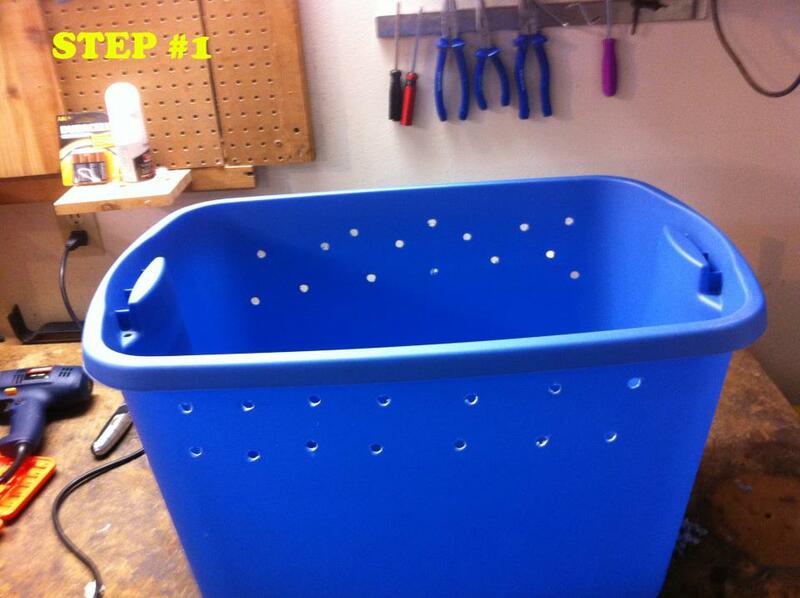 Stay tuned there will be more worm box posts, as I learn, harvest and use the castings and tea. This information was originally found here. Thank you, queen bee! You had me at "worm tea". You ought to write romance. I'm going to have to pass on the worm box action, but I look forward to hearing about its progress. I love the pretty smile on your precious helper's face! I sadly don't have a garage - we turned it into our family room - so I have no where to keep the worms or I would totally do this! 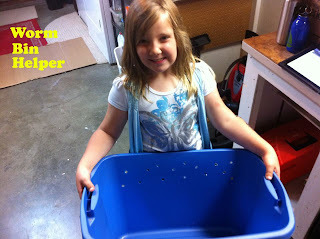 I am so excited about making a worm box! Thanks for sharing your tips.